رضائی, موسی, عرب‌ملکی, وحید. (1392). ارائه حل تحلیلی جدید برای بررسی رفتار ارتعاشی لوله‌های حاوی سیال. نشریه پژوهشی مهندسی مکانیک ایران, 15(1), 6-20. موسی رضائی; وحید عرب‌ملکی. "ارائه حل تحلیلی جدید برای بررسی رفتار ارتعاشی لوله‌های حاوی سیال". نشریه پژوهشی مهندسی مکانیک ایران, 15, 1, 1392, 6-20. رضائی, موسی, عرب‌ملکی, وحید. (1392). 'ارائه حل تحلیلی جدید برای بررسی رفتار ارتعاشی لوله‌های حاوی سیال', نشریه پژوهشی مهندسی مکانیک ایران, 15(1), pp. 6-20. رضائی, موسی, عرب‌ملکی, وحید. ارائه حل تحلیلی جدید برای بررسی رفتار ارتعاشی لوله‌های حاوی سیال. نشریه پژوهشی مهندسی مکانیک ایران, 1392; 15(1): 6-20. در پژوهش حاضر، یک روش تحلیلی بر اساس حل معادلات دیفرانسیل با استفاده از سری‌های توانی به منظور آنالیز ارتعاشی لوله‌های حاوی سیال ارائه شده است. با اعمال روش پیشنهادی به معادله دیفرانسیل حاکم بر ارتعاشات عرضی لوله حاوی سیال و در نظر گرفتن شرایط مرزی، معادله فرکانسی لوله حاوی سیال استخراج شده است. نشان داده شده است که معادله فرکانسی تابعی از مشخصات هندسی و مکانیکی لوله و نیز چگالی و سرعت سیال می‌باشد. نتایج تحلیل نشان می‌دهد که افزایش سرعت سیال باعث افت فرکانس‌های طبیعی لوله می‌شود و در سرعت بحرانی سیال، فرکانس طبیعی اول برابر صفر شده و سیستم ناپایدار می‌گردد. صحت نتایج به دست آمده با استفاده از نتایج تئوری و تجربی موجود به اثبات رسیده است. همچنین، تطابق بسیار خوب نتایج حل تحلیلی ارائه شده با نتایج تئوری و تجربی موجود، دقت وکارآیی بالای روش پیشنهادی را به اثبات می‌رساند. Paїdousiss, M. P., and Li, G. X., “Pipe Conveying Fluid: A Model Dynamical Problem”, Journal of Fluids and Structures, Vol. 7, pp. 137-204, (1993). Liu, L., and Xuan, F., “Flow-induced Vibration Analysis of Supported Pipes Conveying Pulsating Fluid using Precise Integration Method”, Mathematical Problems in Engineering, pp. 1-15, (2010). Weaver, D. S., “On the Stability of Thin Pipes with an Internal Flow”, Journal of Sound and Vibration, Vol. 31, No. 4, pp. 399–410, (1973). Bao-hui, L., Shan, D. H., Hong-bo, Z., Yong-shou, L., and Zhu-fend, Y., “Free Vibration Analysis of Multi-span Pipe Conveying Fluid with Dynamic Stiffness Method”, Nuclear Engineering and Design, Vol. 241, pp. 666–671, (2011). Guo, C.Q., Zhang, C.H., and Paїdoussis, M.P., “Modification of Equation of Motion of Pipe Conveying Fluid for Laminar and Turbulent Flow Profiles”, Journal of Fluids and Structures, Vol. 26, pp. 793–803, (2010). Sweilam, N. H., and Khader, M. M., “Approximate Solutions to the Nonlinear Vibrations of Multiwalled Carbon Nanotubes using Adomian Decomposition Method”, Applied Mathematics and Computation, Vol. 217, pp. 495–505, (2010). Paїdousiss, M. P., “Fluid Structure Interactions: Slender Structures and Axial Flow”, Vol. 1, Academic Press Inc., Londan (1998). Paїdousiss, M. P., “Fluid Structure Interactions: Slender Structures and Axial Flow”, Vol. 2, Elsevier Academic Press, Londan, (2004). Housner, G.W., “Bending Vibrations of a Pipe Line Containing Flowing Fluid”, Journal of Applied. Mechanics, Vol. 19, pp. 205-208, (1952). Lai, X., and Yirang, Y., “Galerkin Alternating-direction Methods for a Kind of Nonlinear Hyperbolic Equations on Nonrectangular Regions”, Applied Mathematics and Computation, Vol. 187, pp. 1063–1075, (2007). Yi-min, H., Yong-shou, L., Dao-hui, L., Yan-jiang, L., and Zhu-feng, Y., “Natural Frequency Analysis of Fluid Conveying Pipeline with Different Boundary Conditions”, Nuclear Engineering and Design, Vol. 240, pp. 461–467, (2010). Lees, A. W., “A Perturbation Approach to Analyze the Vibration of Structures Conveying Fluid”, Journal of Sound and Vibration, Vol. 222, No. 4, pp. 621-634, (1999). Bao-hui, L., Hangh-shan, G., Hong-bo, Z., Yong-shou, L., and Zhu-feng, Y., “Free Vibration Analysis of Multi-span Pipe Conveying Fluid with Dynamic Stiffness Method”, Nuclear Engineering and Design, Vol. 241, pp. 666–671, (2011). 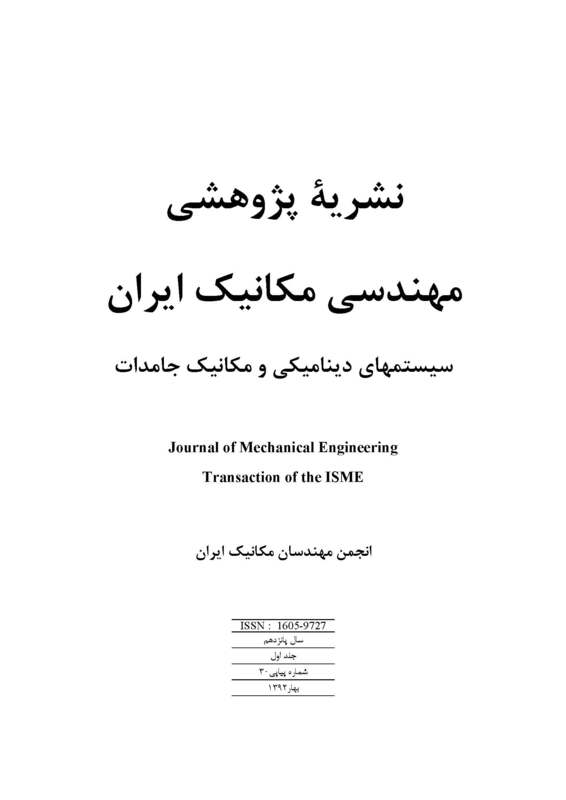 Sadeghi, M., H. Karimi-Dona, M., “Dynamic Behavior of a Fluid Conveying Pipe Subjected to a Moving Sprung Mass – An FEM-state Space Approach”, International Journal of Pressure Vessels and Piping, Vol. 88, pp. 123-131, (2011). Vol. 240, No. 1, pp. 189-194, (2001). Seo, Y. S., Jeong, W. B., and Jeong, S. H., “Finite Element Analysis of Forced Vibration for a Pipe Conveying Harmonically Pulsating Fluid”, JSME International Journal, Vol. 48, No. 4, pp. 688-694, (2005). Vol. 86, pp. 133–139, (2008). Ni, Q., Zhang, Z. L., and Wang, L., “Application of the Differential Transformation Method to Vibration Analysis of Pipes Conveying Fluid”, Applied Mathematics and Computation, Vol. 217, No. 6, pp. 7028-7038, (2011). Vol. 154, pp. 431–441, (2004). Xu, M. R., Xu, S. P., and Guo, H. Y., “Determination of Natural Frequencies of Fluid-Conveying Pipes using Homotopy Perturbation Method”, Computers and Mathematics with Applications, Vol 60, pp. 520-527, (2010). Jeffry, A., “Advanced Engineering Mathematics”, Harcourt Academic Press, USA, (2002). Greenberg, M. D., “Advanced Engineering Mathematics”, Prentice Hall Inc.
 Lee, S. I., and Chung, J., “New non-linear Modeling for Vibration Analysis of a Straight Pipe Conveying Fluid”, Journal of Sound and Vibration, Vol. 254, No. 2, pp. 313-325, (2002). Gatti, P. L., and Ferrari, V., “Applied Structural and Mechanical Vibrations Theory Methods and Measuring Instrumentation”, E & FN Spon, London, (1999). Dodds, H. L., and Runyan, H., “Effect of High-velocity Fluid Flow in the Bending Vibrations and Static Divergence of a Simply Supported Pipe”, NASA Technical Note D-2870, (1965).